Gagasi FM is a commercial radio station in KwaZulu Natal that reaches the urban and peri-urban black youth. It is also the largest regional commercial radio station in South Africa when comparing audience figures *(RAMS Aug-Dec 2012). The station harnesses a strong local identity and embraces KZN's urban and peri-urban black youth market by broadcasting in Zunglish - a combination of English and isiZulu. Although the station's footprint officially stretches from Durban to St Lucia in the north, inland to Ladysmith and as far south as Kokstad and Port Edward, its listenership is growing quickly outside provincial borders and it currently attracts just under 1.8 million listeners weekly. Gagasi FM provides advertisers with unmatched levels of brand activation, reaching out to a target audience of Black young urban and peri-urban youth between the ages of 16 - 34 (LSM 4-7). Gagasi FM strives to remain relevant and keeps in touch with what matters most to its listeners, meeting their information and educational needs through specialist features, focused events and promotions. Content includes dedicated lifestyle features and specialist slots such as news, sports, traffic reports, competitions and on-air features. The station boasts lively and talented on-air presenters who are passionate about what they do. As a young, hip, fresh, trendy and youthful station, Gagasi FM is music driven. The music format offers a diverse mix of R&B, Durban Kwaito, Afro House, Afro Pop, Hip Hop and Classic Soul. The station conducts regular research exercises to ensure that listeners only hear what they want to hear. As result of this, the station is a trend setter for KZN's black youth market. This is underscored by partnerships with KZN's top artists and recording companies e.g. Afrotainment (Big NUZ, DJ Tira, DJ Cyndo and DJ Siyanda). Through Gagasi Music Sessions, Gagasi FM has assisted in bolstering several up and coming artiststhat have now become national sensations e.g. Dream Team. Last year, the Topstars Reality Show was launched to help listeners and aspiring DJs achieve their dreams of becoming on air presenters at Gagasi FM. Nomfundo Mzolo from Empangeni won out against thousands of hopefuls, receiving a one year on air presenter contract and an assured slot on radio every weekday as well as other cool prizes. Gagasi FM has also put its stamp on music in KZN by becoming media partners for high profile music events starting with the Chris Brown concert in December 2012. In 2013 Gagasi FM has continued with these strong media partnerships, starting with the Music At The Lake Series in April, and in May the MTV Africa All Stars KwaZulu-Natal starring Snoop Lion, performing his greatest hits interspersed with his new "Reincarnated" reggaeflavoured repertoire and including Nigerian superstar 2 Face, Flavour and Zakes Bantwini. In the same month of May, this was followed by gospel music extravaganza, Ayihlome, starring award winning American gospel greats, Donnie McClurkin and Cece Winans. Vuyokazi Mhlophe, brand activation and marketing manager at Gagasi FM, said it is such an honour for Gagasi FM to support music driven partnerships as music is at the heart of many South African's and Gagasi FM listeners. The 2013 line-up sees an increase in music output on weekends as well as a focus on sports in the mornings. 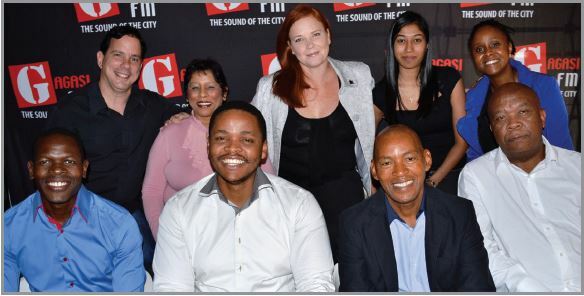 "This will ensure that we remain the number one sound of the city, retain the uniqueness of the station's personality and continue to provide our listeners with what they want," says Vukile Zondi, Gagasi's programme manager. Listeners tune in for a "wake-up" call with Alex and the Morning Crew. The show is anchored by well-known KZN radio personality Alex Mthiyane - a seasoned journalist who previously worked as a news reader and presenter at both the SABC and DSTV. 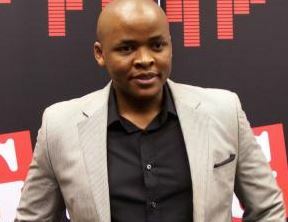 His co-host is comedian Kini Shandu, and producer Jacinta Ngobese. The show engages with listeners on everything from current issues to sporting events and breaking news, giving them a platform to challenge each other on air through a feature called Zindala Zombili through a feature called "Ziphendulele" listeners, celebrities and business people have a platform to share their side of the stories that appear in the tabloid media. Vuyokazi Mhlophe. LEFT TO RIGHT FRONT - Alex Mthiyane, Vukile Zondi, Chris Meyiwa, Patrick Bogatsu. with fun and interactive features like Ssh Ungath' uzwe ngami where listeners can share tongue-in-cheek office gossip with Zookey - all in the name of fun and not to be taken seriously. Lunchtime is all about smiles and laughter with Mzokoloko and his producer Njabs Zwane. They target a wide audience that includes the people in the workplace, listeners, students and people on the road. The show brings an informative, entertaining and relaxed feel to the airwaves and puts a comedic slant on almost everything. This show is unashamedly cheeky and loud! It puts the spring back into the step of those on their way home by giving listeners a fun way to end the day. It is intelligently funny, brutally honest and interactive - anything but the ordinary day-to-day show. From Tuesday to Friday, the charismatic Pastor Sthembiso Zondo presents Aha Moments that includes motivational advice on day-to-day living. Another innovative touch sees Durban's Zulu white boy, Wade Delagey - who is well known as "Skhokho" or "The Zulu White boy" on SABC1's local comedy series Abomzala - bring a unique and special flavour on weekdays. He joined Gagasi FM as a show producer after having worked on former Durban radio station DYR (Durban Youth Radio) and being one of the Live presenter search Top 4 finalists competing with the likes of Luthando "Loot love" Sosha and Nomuzi "Nomoozlie" Mabena. Over the past few years the station has reached out to communities in need. Station CSI programmes include the 'Back to School' campaign called "Geleza ne Gagasi". Listeners with children from disadvantaged backgrounds who achieved high academic marks were encouraged to submit their child's/children's academic report from 2012, along with a motivational letter explaining why they need Gagasi FM's help. Every day, Gagasi FM presenters contacted a number of parents, offering them assistance with school fees, stationery and school uniform vouchers sponsored by Spar, Trustees and Gem Clothing. their size 8 high heel shoes. Customer Base: Approximately 1,8 million listeners are tuned in weekly to Gagasi FM"
To be hip and youthful and the radio station of choice for our listeners, customers and employees. To be a uniquely KZN radio station that connects with young adult urban Black listeners.